Are these icon ones really this pricey? The bid start seems okay, but the BIN price is up there (for my budget at least!). It is pretty cool looking. And there are a couple of these, are they old enough to be pre-China? The Alien Icon (Lav-Alien) is a decent starting price, but the BIN option is a joke... especially with the junker globe. I have no clue what the lava phone is actually worth, but on ebay they seem to be listed for 50-100. I don't know my icons at all, but they seem to go for a lot. I'm glad you asked about the red box 32oz, I was wondering too if they were pre china. Lava phones $20-$40 range. They tend to run hot too. Ive seen that red box listed before and it didnt sell. If you look through the listing on the clear/green 32oz you can actually see the last picture on the listing shows the globe and cap and it looks like a china white cap with red sticker to me. The first two the alien and the phone are USA lamps the 2nd is a china - the logo is after they moved to china and the picture of the lamp on the box is not real - I am quite sure USA lamps had real pictures on the box. Icon lamps are American bottled lamps and man the prices are all over the place. Sometimes they go pretty cheap and other times way higher than they are worth. For me I don't do Icons, the cutesy lamps are of no interest to me but they are or were pretty popular over all. To add to what Critter said, the phones do indeed run hot. I switched the standard 40 watt bulb for a 30 watt, and now it runs perfectly. I also switched out the blue globe for an orange/white, since the blue doesn't really match the color of the phone. I totally agree. I actually got my phone as a $5 extra with my starship and some other lamp on Craigslist. Mine runs hot enough to need a dimmer. Haven't looked lately but I may have cooked it a bit. Non lava lovers probably would pass over the phone for a more traditional lamp. Where did you find a 30w bulb. I've been looking for 30 or 35w bulbs as an alternative to putting a dimmer on my hot running Midnight. Going to Menards soon to get a dimmer and they have a huge selection of bulbs, but I've never seen a 30w or 35w bulb there. Maybe I haven't looked hard enough. I saw a 30w small flood bulb, but it was too tall and would keep the globe from fitting into the base properly. if i knew LL had a lava phone i would have purchased it in the 90's. 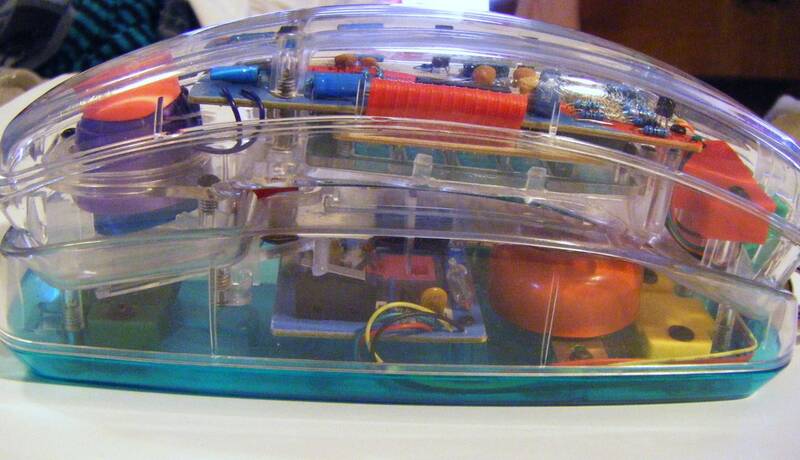 instead i had this see-through phone in my room.